Message: I’m a new dyer … and was excited by your comment about the remazol type dyes. I’ve carefully read your ‘low immersion’ tutorial … and am wondering … are there any changes/alterations you’d suggest for using this type of dye over the procion type? Remazol dyes work very well for low water immersion dyeing. (See my page about Remazol dyes, “About Vinyl Sulfone Fiber Reactive Dyes“.) They are among my favorites. They will work well when used exactly the same as Procion dyes. There are a couple of differences, though, that it’s handy to be aware of: give them extra warmth to react (ideally 140° F), and let them cool before rinsing out the excess dye. Names for Remazol dyes. These dyes, chemically known as vinyl sulfone dyes, were originally sold under the brand name Remazol, so this is one of the names they are commonly known by. PRO Chemical & Dye sells them as PRO Liquid Reactive Dyes. 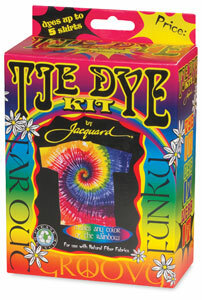 Dharma Trading Company and other retailers for Jacquard Products sell a slightly different selection of the same type of dye as Jacquard’s Vinyl Sulphon Liquid Reactive Dyes, “Vinyl Sulphon” being a brand name derived by two changes in spelling from the generic name. The same class of dyes is also found in Jacquard Red Label dyes and Jacquard Green Label dyes, but there is no reason to seek out those older brands of dyes. Warmer reaction temperature. The Remazol dyes are similar to the Procion dyes, but they do like a warmer reaction temperature, so I either place the buckets I’m using to dye in into a sink of hot water, after I’ve added everything, or I use a glass container or unsealed ziplock bag and heat for a minute or two in the microwave–not enough to make the dye mixture boil, but enough to make it hot to the touch (on the outside of the container). This is not strictly necessary, unless your dyeing room is cold, but you will get a better color yield with added heat, as the ideal reaction temperature of Remazol dyes is around 140°F (60°C). If you use the sink full of hot water method, be careful not to fill the sink deeper than the liquid level inside the buckets, because if they float they can tip over. Possible alternatives to soda ash. Like the Procion dyes, Remazol dyes require a high pH in order to react with the cellulose in cotton and other plant fibers. One of the ProChem recipes calls for potassium carbonate as the dye fixative for the Remazol dyes, rather than the usual sodium carbonate (soda ash), but I don’t see any difference between the two. In my measurements, the pH is the same, and my experience is that the effectiveness is the same. Remazol dyes have an ideal reaction pH that is a little higher than that of the Procion dyes, around a pH of 11.5 instead of 10.5 to 11.0. When I have trisodium phosphate handy, I use it instead of soda ash, for Remazol dyes, but soda ash will work fine, especially if you are careful to add warmth. Trisodium phosphate is sold in a small box labeled “TSP” in the paint section of many hardware stores, for use in washing walls before painting. You should wear safety glasses when working with it; it is more caustic than soda ash. Cool before initial rinsing. Remazol dyes should not be washed out under hot alkaline conditions, alkaline conditions being at a high pH, which is when they are in the presence of soda ash or TSP. Because their dye-fiber bond is different from that of the Procion dyes, they can be vulnerable to becoming detached from the fabric at a high pH, even after they have bonded properly to the cellulose or silk fiber. This means that it is important to rinse the excess dye out, after dyeing, with cool water. It is best to allow the dyeing containers to cool to room temperature before you rinse them out. Sometimes when I’m in a hurry I dump in ice cubes, directly into the dyebath, so that I can be sure the first rinse is not hot. Do not use hot water for washing until after the soda ash or TSP has been removed with cool water. After the high-pH dyebath water has been rinsed out, it is then safe to wash out the unattached excess dye with hot water. With all of the fiber reactive dyes, including both Procion and Remazol dyes, it is necessary to use very hot water if you want to be as thorough as possible in washing out the excess dye. Here are some examples of pieces I’ve dyed with Remazol dyes, using LWI techniques (which I am quoting from the old Dye Forum)…. For a total of one liter of hot tap water, I used 1/3 cup soda ash (80 ml) and 1/2 cup salt (120 ml), each dissolved separately first. (Both are probably excessive.) I used 45 ml of Red Label Yellow (possibly only 30, as I lost track) and 15 ml of Red Label Apricot. As you can see, after folding it in half vertically (which is why half of the shirt is sharper in detail than the other half), I loosely pleated the shirt horizontally before placing it in the glass container I used for the LWI. I pressed it quite a bit with a spoon after adding the yellow, before adding the apricot, since I wanted a yellow background, not a white one, but the tight confining of the cotton in the glass container caused the background to be quite a pale yellow, anyway. 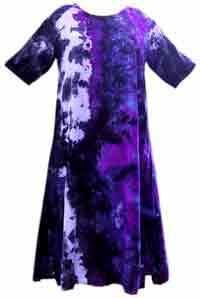 Here’s another piece I dyed with remazol (vinyl sulfone) dyes, a long rayon dress. I crumpled the dress tightly, making very rough horizontal pleats, and fitted it tightly into a glass container. Then I poured three cups of dye over different parts of the dress: 1 teaspoon (5 ml) of PRO Black 50% LR604 Liquid Reactive Dye in one cup (250 ml) of water; 1 teaspoon of PRO Intense Blue 50% LR406 Liquid Reactive Dye in one cup of water; and 1 teaspoon of PRO Fuchsia 50% LR308 Liquid Reactive Dye in one cup of water. Finally, I added 5 teaspoons (25 ml) of soda ash, dissolved in yet another cup of water, and microwaved to set the dye rapidly. 3. Remazol dyes are so much less trouble to use! Just lately I’ve been experimenting with remazol dyes, which are a kind of fiber reactive dye known as vinyl sulfone dye. After using Procion MX dyes, these are so easy to use! Not that Procion MX dyes are at all difficult, it’s just that measuring out the dye powders can be a bit of a pain. Since I am buying the remazol dyes in liquid form, I don’t have to mess with the inconvenience of dye powder. No need to turn off the A/C and fans and wear a dust mask to measure them out. Since I’m dyeing in my kitchen, this is a huge convenience…. When measuring out the remazol dye, all I have to do is wear gloves. 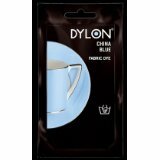 I measure out a teaspoon of dye into a cup, add water, give a single quick stir, and it’s ready to use. There is no need to expend any effort on dissolving! The liquid concentrate stays good for at least a year. The dyes I’m using right now are PRO Chemical & Dye’s Liquid Fiber Reactive Dyes. When measuring out dye powder, such as my original favorite, Procion MX dye, I have to remove every food item, every cutting board, the garlic press, anything that could have an errant particle of dye powder land upon it, from the entire room. Even though most of the dyes we use are reasonably non-toxic, it is important to act as though they are dangerous, just in case we someday discover that one of them is. 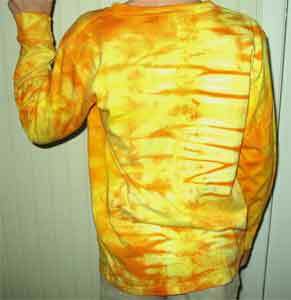 And, a few of our acid dyes are somewhat toxic. I’ve been in a hurry, and I’ve been using LWI techniques, so I’ve been heating in the microwave for a minute or two, instead of batch-curing overnight. Here is the recipe I used to make the blue/turquoise LWI shirt shown above…. • Crumple one PFD rayon blouse, prewashed, pleating loosely. • Place crumpled blouse into glass container that is small enough to hold it tightly, with all fabric below the top of the container (I used a 7 cup (1.75 L) Pyrex bowl. 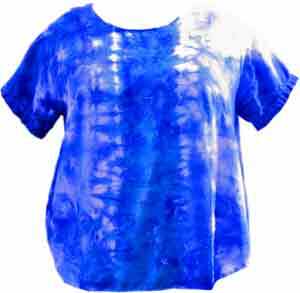 • Pour blue dye mixture over blouse in container. • Pour turquoise dye mixture over blouse, being sure to cover any areas left white by the blue dye in the previous step. • Let rest twenty minutes for colors to blend and move on the fabric. • Dissolve 4 teaspoons (20 ml) soda ash in one cup of warm (not hot) water and pour evenly over blouse. • Cover tightly with plastic wrap and microwave for two to three minutes, until water is very hot but plastic wrap is not bulging upwards very far. • Allow to cool until merely warm to the touch. • Wash at least twice in hot water, with detergent, until color no longer bleeds into the rinse water. This entry was posted in low water immersion (LWI), Remazol dye on October 29, 2015 by pburch. Message: Hi—I’ve been searching for an answer all over the internet—I hope you can help me. I have 100% white cotton material. I want to dye it a light gray—maybe even a blue or brown. It’s for a cat toy so it will be chewed on. So I need the color to be non toxic, no scent (as much as possible) and hold to the fabric. I don’t want my kitty’s mouth to turn colors! The least toxic dye for an item that will be chewed on, aside from edible food coloring dyes which work only on silk or wool, not on cotton, is a dye that forms such a strong chemical bond to your material that it does not come off when moistened. This means that you need to choose a highly wash-resistant dye. Do not use all-purpose dye, such as Rit, because it tends to bleed in warm water. Instead, use a fiber reactive dye. An excellent fiber reactive dye is Procion MX dye. It is often difficult to find fiber reactive dye in local shops. Look at the Jacquard Products website to try to find a local retailer who carries Procion dye, using their Where to Buy It page, or order your Procion dye online. See my page, “Sources for Dyeing Supplies Around the World”. You will also need soda ash or washing soda to chemically set the dye; you can buy soda ash from your dye supplier or from local sources, such as swimming pool suppliers. The easiest method for dyeing cotton with Procion MX dye is called low water immersion dyeing. It requires only small amounts of water, and can produce interesting color mottling. 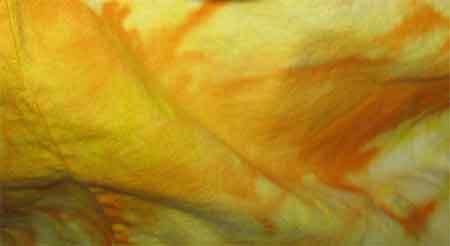 See “How to Do Low Water Immersion Dyeing”. All you need is a plastic container, Procion dye, water, soda ash or washing soda (not baking soda! ); salt is optional. You will dissolve your dye in water before pouring it over the fabric, and do the same with your soda ash. You will need to be sure that the dye is in a warm place, at least 70°F (21°C), to get a good reaction of the dye with the cotton. Not all of the dye you add will react with the fabric, so add more dye than it seems at first that you will need. Any sort of dye powder can produce allergies, so it is a good idea to avoid breathing dye powder. It’s best to wear a dust mask when measuring out the powder. Although Procion dye is not particularly hazardous, it is also a good idea to wear gloves, to avoid excessive exposure to the dyes. You should do this with any kind of dye that you use. Like many household chemicals, soda ash is irritating to the skin, so wear gloves, and wash it off if you get it on your skin. After you have finished dyeing your fabric, you will need to wash out all of the unattached dye. You can do this by washing once in room temperature water, then several times in very hot water, at least 140°F (60°C). You can even use boiling water, if you wish, for the greatest efficiency in color removal. Fabrics dyed with less wash-resistant dyes will lose much of their color when boiled, but Procion MX dyes can easily withstand boiling, so only the unattached portion of the dye is removed. To test whether you have removed absolutely all of the unattached dye, moisten the dyed material and place it between two white cotton rags, then use a hot iron to press it until dry. If there is no color transfer to the white cloth, you are done; if some color does transfer, wash again in hot water and repeat the test. There will be no scent remaining on the dyed fabric after it is washed. 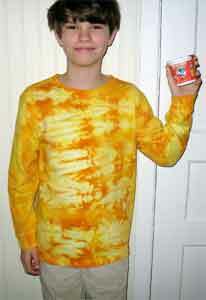 You can use this same method to dye anything that is made of cotton, or other dyeable fibers such as rayon or hemp. You can use a dull color of dye for subtle effects, or combinations of bright colors for brilliant results. If you use a small container and crumple your fabric tightly, you will get contrasting intensities of dye on different parts of the material, while if you use more water and stir the fabric around in the dye, you will get less variation in color. This entry was posted in dyeing cotton, low water immersion (LWI), Procion MX dye on November 28, 2014 by pburch.